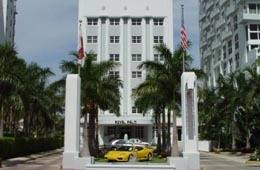 Miami Beach 411 > Hotels > 4-star > Royal Palm Hotel in Miami Beach, FL. ¿Hablas Español? ABOVE: A video of the lobby and elevator at Royal Palm Hotel. Watch more hotel videos. This page allows you to watch a video, find directions, post a comment, read reviews, and check rates at the Royal Palm Hotel. From the moment you step inside the Royal Palm, you can feel the history, with it's classic architecture, furnishings and vibrant colors that take you back to those glorious "deco days." The Resort offers great recreation facilities. Guests can just step outside the hotel's backdoor, directly onto the beach for sunbathing and water sports activities. The hotel's two outdoor swimming pools and whirlpool provide both relaxation and great views of the ocean. For hotel guests wishing to maintain their fitness regime, the latest exercise equipment is available at the hotel's Fitness Center. The hotel offers 6000 square feet of meeting facilities, including outdoor function space. The meeting rooms can host events accommodating from 10 to 300 guests. Wired Internet access (Cable connections) is available in the guest rooms for a charge of $10 per day. • Pets allowed - under 20lbs. • The Royal Palm accepts pets for an additional charge of $100 per stay. • At the end of the Causeway, A1A becomes 5th Street. • Continue East on 5th Street 7 blocks to Collins Ave.
• The Royal Palm is on the Left (East) side of the street. Need a limo to Royal Palm Hotel? Call Miami limo service. The Royal Palm is located at 1545 Collins Ave., Miami Beach, FL 33139. Use our Miami hotel map to find the exact location. Small rooms. Small beds. Terrible service. Had to wait 1/2 hour to check in. Re$10 per day resort fee is tacked on to rate but the only thing you get is padded lounge chairs on the beach. Staff is rude and so is management. Be careful, someone ordered poolside liquor $21.00 charge was put on my bill even though I was never poolside and it took 3 phone calls and 1/2 hour of my time to get it removed. Royal Palm "Great service and location"
Spent a week at the Royal Palm and I greatly recommend this hotel. I had a beautiful view of Ocean Drive from my room. Walked from the hotel to the beach every morning (about 40 steps). Service is very good and it is conveniently positioned in South Beach. Good for business, good for pleasure. 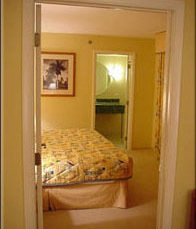 Click HERE for Royal Palm Lodging Information. Royal Palm Hotel in Miami Beach. Miami hotel reservations.